Student retention is one of the most pressing issues in higher education today. 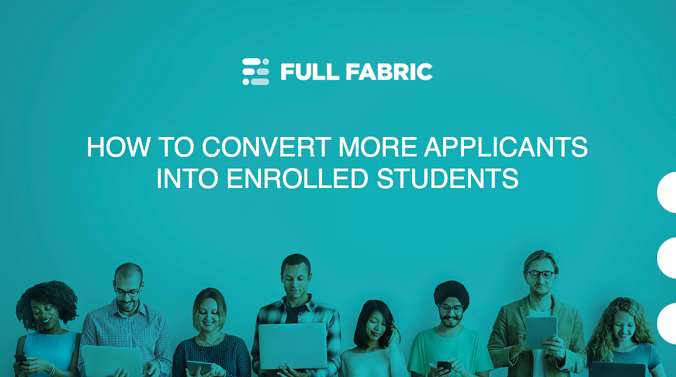 While much of the discussion centres around ensuring enrolled students don't drop out, many universities are particularly concerned with improving their conversion of applications to enrolments. Higher education institutions are looking for a solution to reduce the amount of admitted applicants who don’t go onto to enrol at the start of the academic year. At the centre of this issue is students’ sense of belonging. In higher education, belonging is critical to student retention and success. This sense of belonging is tied to how at home and valued students feel at an institution: essentially, whether they feel that the university is the right place for them to be. This desire to belong often depends on a student’s interpersonal relations at their place of learning. Research shows that the extent to which students feel personally connected to the social milieu of the university directly affects whether they’re likely to stay enrolled or leave. Belonging is the result of engagement, and is most effectively nurtured through activities that the whole student body can participate in. Students need to feel respected, included and supported by others in the school social environment, and perceive that interpersonal relationships have stability. Student engagement is often strengthened through their participation in academic, pastoral and professional development services. These services can make students feel more active in their educational experience and develop knowledge and skills beneficial for their study and professional development. Students’ sense of being accepted, valued, included, and encouraged by teachers and peers in the classroom has a significant bearing on their sense of belonging. They need to feel their personal autonomy is respected. Engagement and belonging are critical in ensuring that accepted applicants go onto become engaged and content enrolled students. To find out more about how a sense of belonging can benefit your university’s applicant conversion rates, download our ebook: how to convert more applicants into enrolled students.